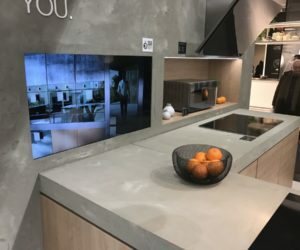 Concrete countertops are on-trend right now, for many people even replacing the granite that was the elite countertop material of choice for the last 10-20 years. 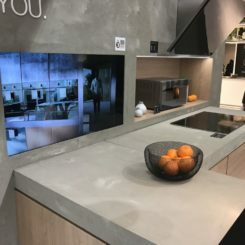 You may or may not be aware that you can replicate the look of concrete kitchen countertops with a concrete underlayment called Ardex Feather Finish, spread onto existing countertops and sealed with multiple layers of sealant…and for a fraction of the cost of custom concrete countertops. 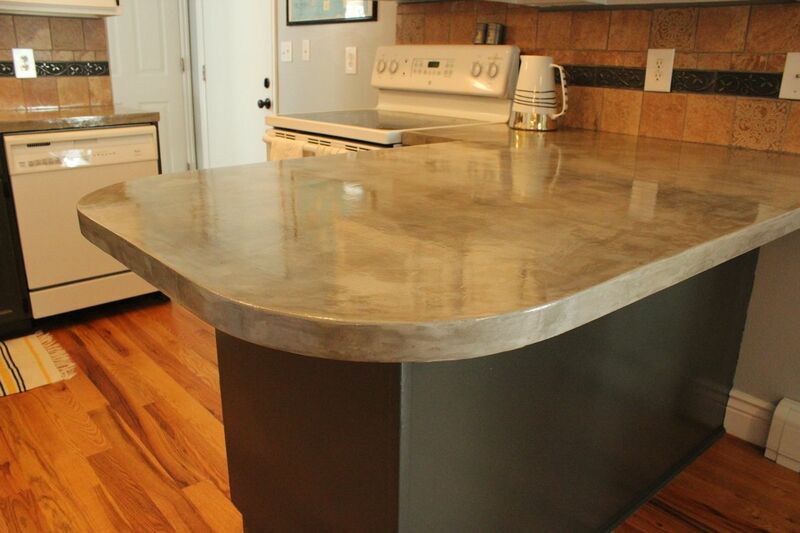 Ready to get started on your own concrete kitchen countertop transformation? 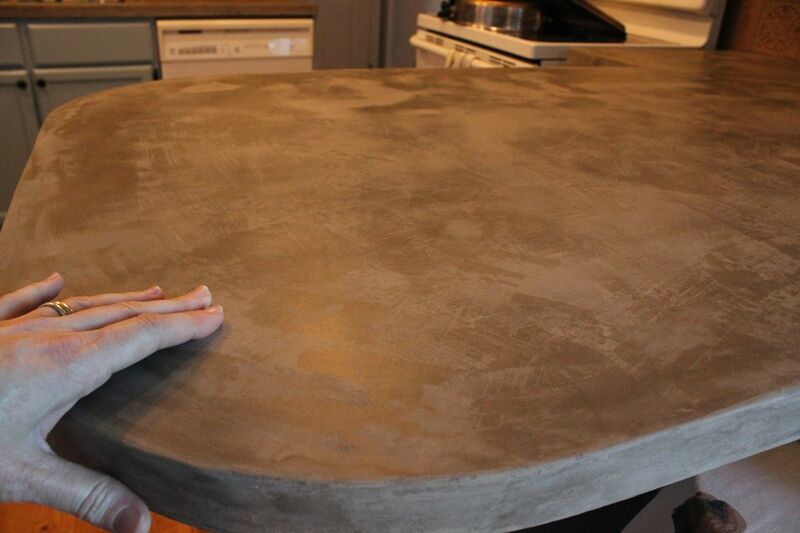 Here’s how to make concrete countertops. 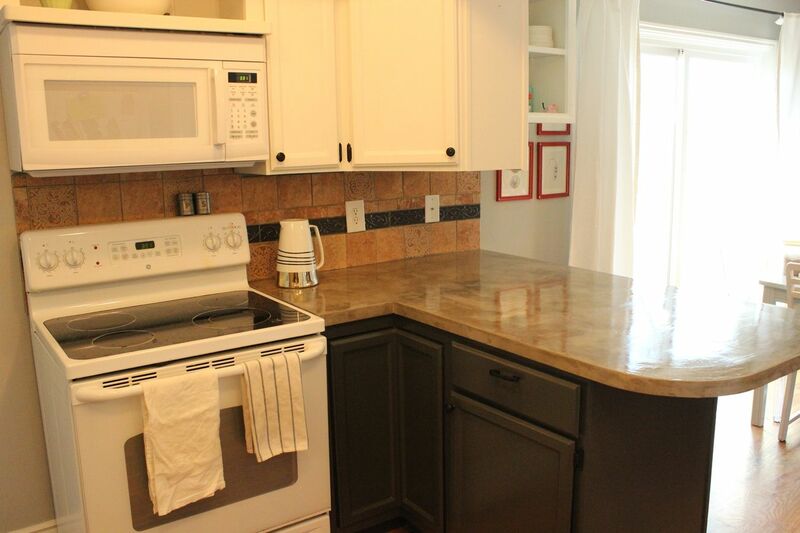 Step 1: Clean up existing kitchen countertops. 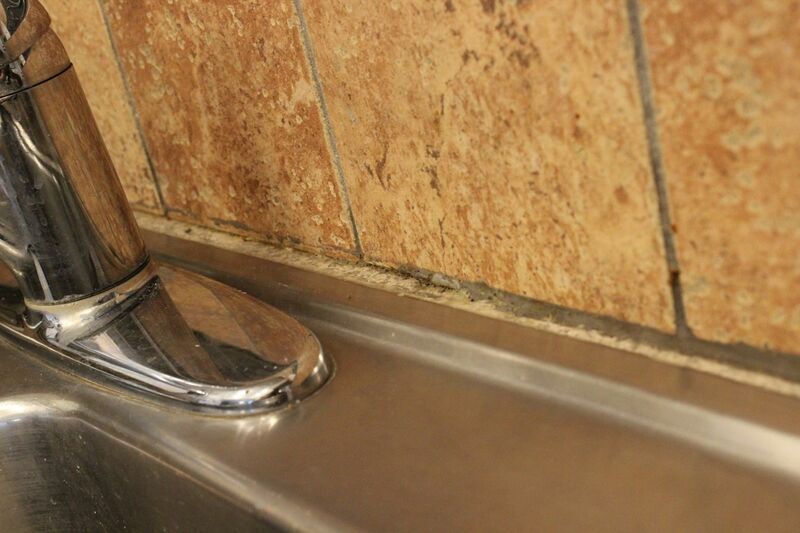 It’s critical to begin with a clean, grease-free surface. 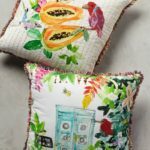 Use your favorite cleaner to wipe everything down. 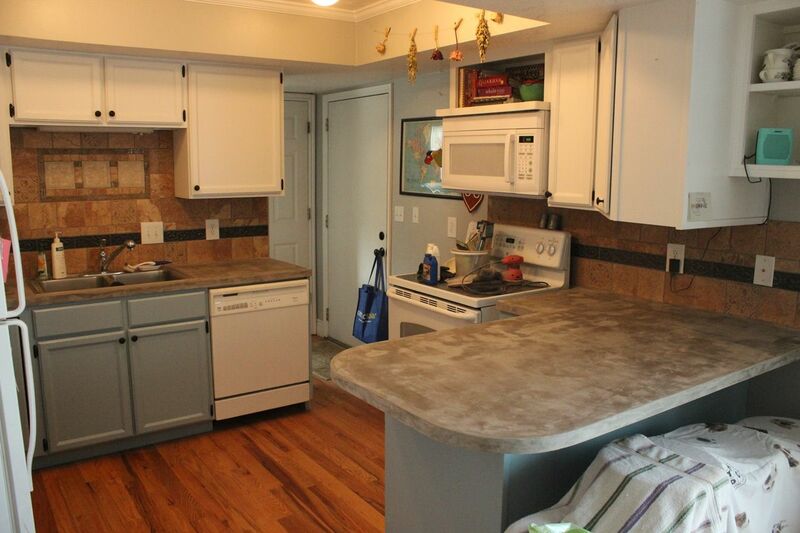 If your countertops have any loose edges or bumps, it’s the time to get rid of the moveable material. 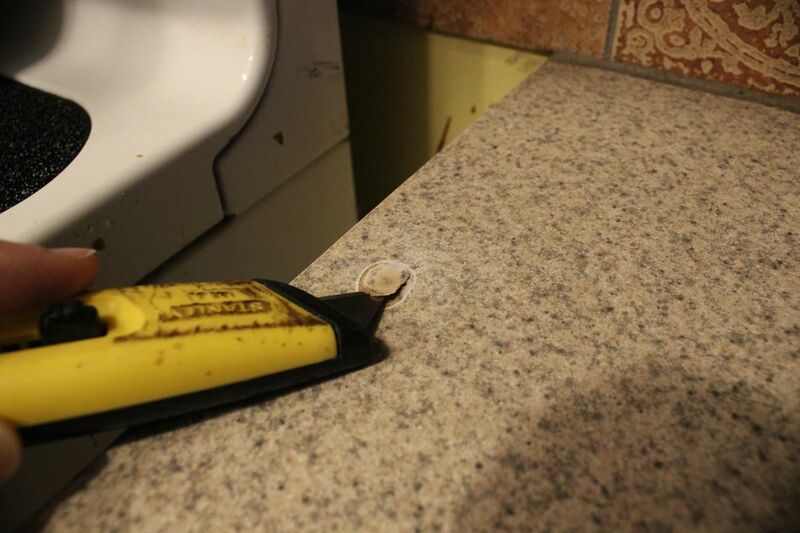 My countertop had a burned bump that I could push on and move, so I just cut it out. 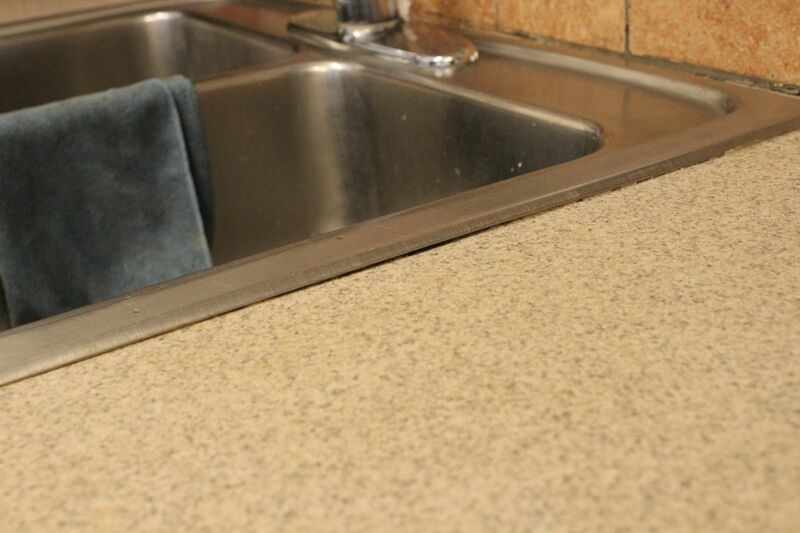 If your countertop has scratches or dents or holes, this covering will take care of those things. Don’t worry about them. 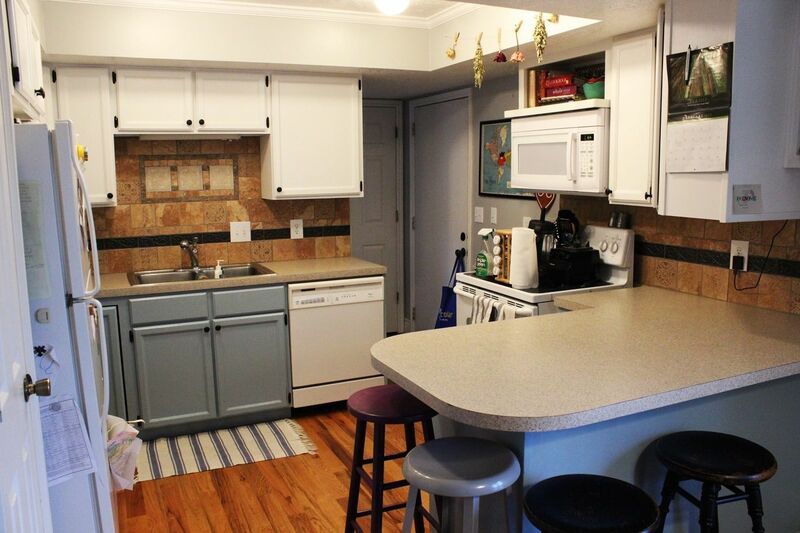 Pay special attention to the space around your sink. 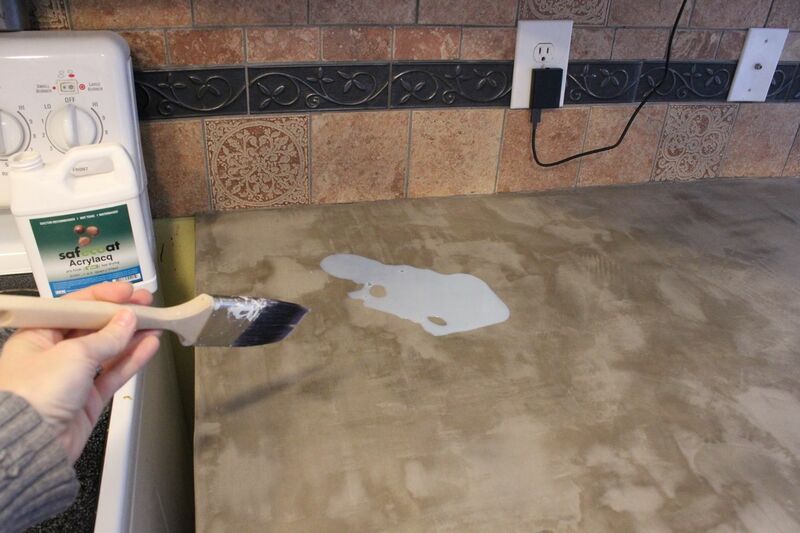 If you have silicone sealant or similar that is visible, you’ll want to remove it with a razor blade before you begin spreading the concrete, because (I learned) the concrete doesn’t stick well to the rubbery surface. 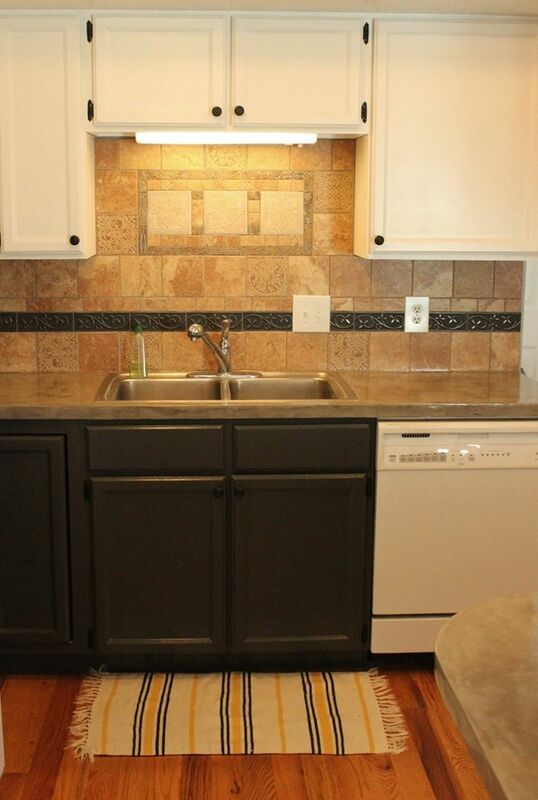 I removed loose grout behind the kitchen sink and left the space bare. 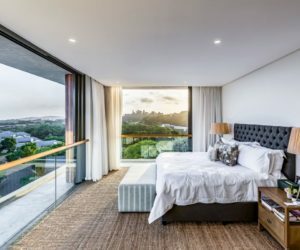 The concrete filler will take care of these spaces. 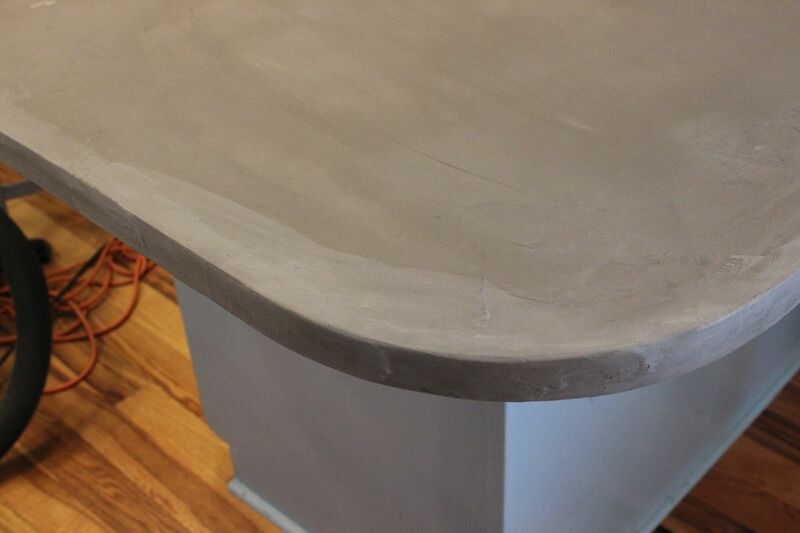 Step 2: Sand the countertops with coarse sandpaper. 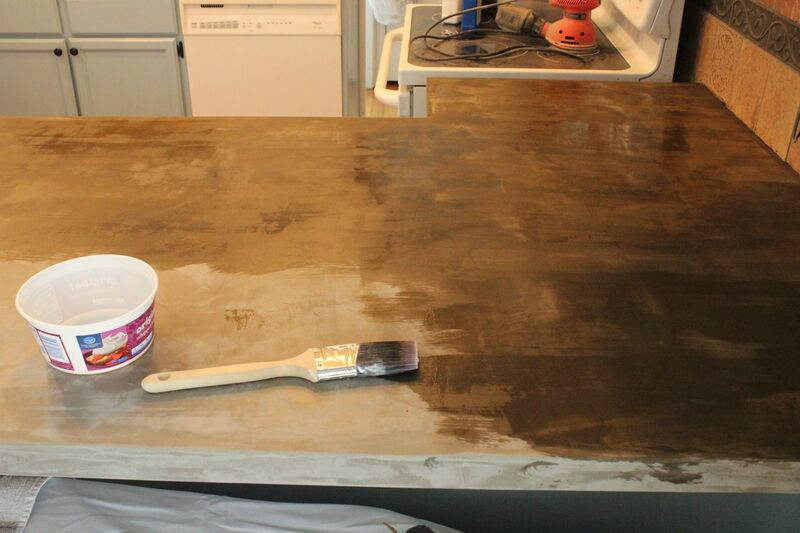 Use 60- or 80-grit sandpaper to rough up your countertop. The idea is to scratch it so the concrete has something to “hold on” to. 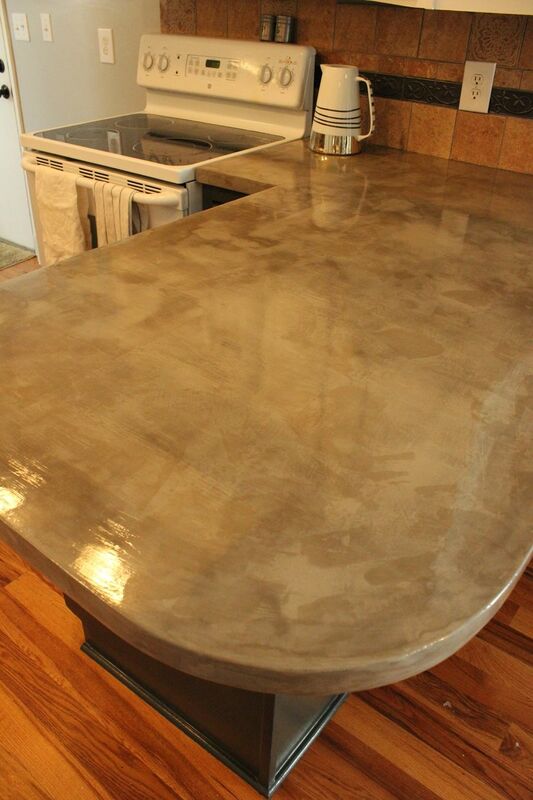 Clean and dry the countertop thoroughly after sanding before proceeding. 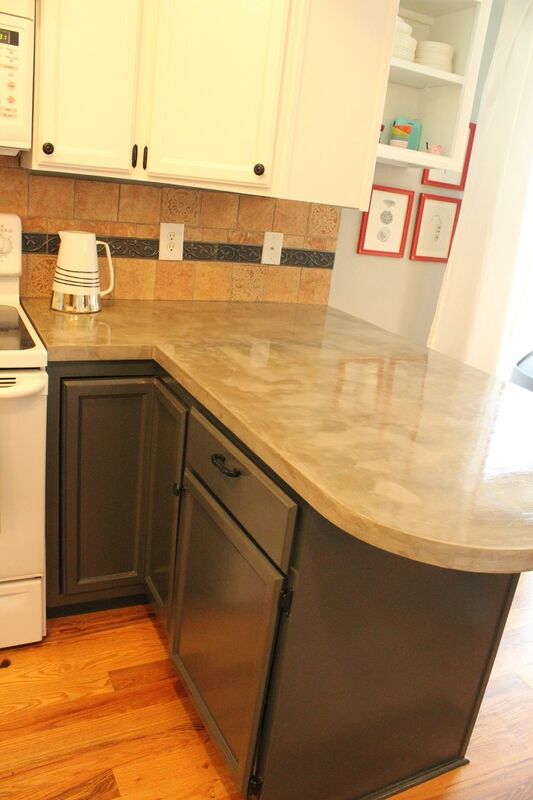 Step 3: Mix up a small amount of Ardex Feather Finish. The manufacturer’s instructions recommend a 2:1 powder-to-water ratio. This is a good place to start, and you’ll be able to tell if that’s the ratio that works for you. 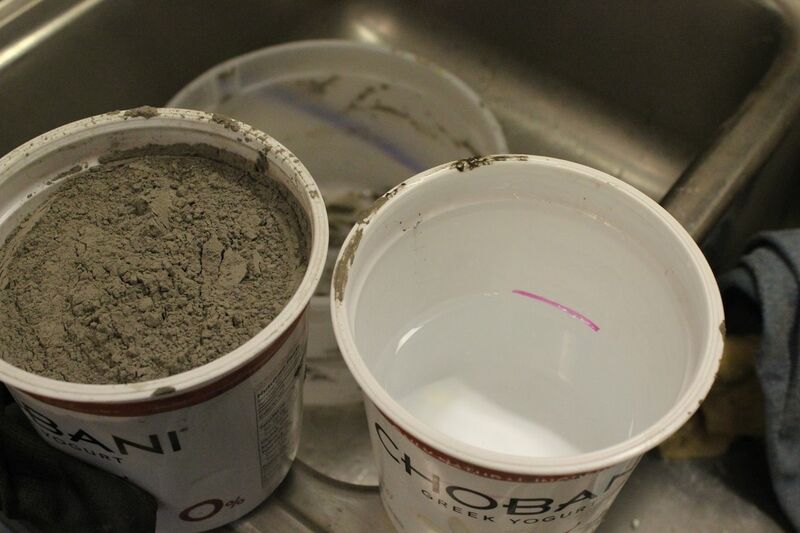 It’s important to use the same ratio for each batch that you mix up for one layer, because even small differences in water content can (and will) slightly alter the color/darkness of the dried concrete. 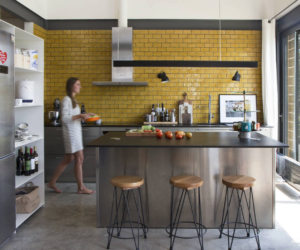 You’ll probably be mixing up several batches per layer. 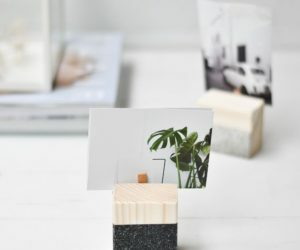 Ideally, you want a consistency not unlike peanut butter, where the concrete will stick to your putty knife (or trowel) when it’s held up vertical. 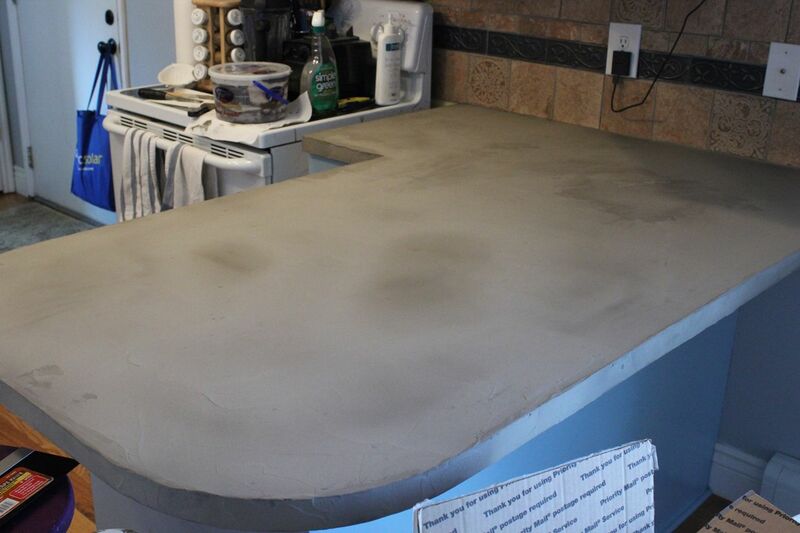 Step 4a: Working in small sections at a time (maybe 1’ x 1’), spread concrete over countertop surface. I found it easiest to glop down about a cup-full in the center of my square foot working space. 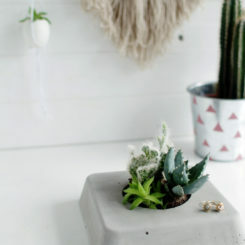 Place your trowel into the concrete and swipe it so that there is a fairly even strip of concrete all across the edge of the trowel. 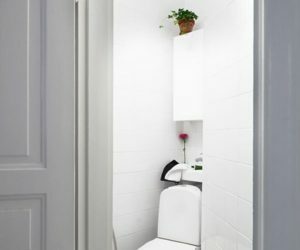 Begin in a corner, and drag the trowel smoothly. Pick up trowel, and move over so there is an inch or two of overlap, then spread again in the same direction. 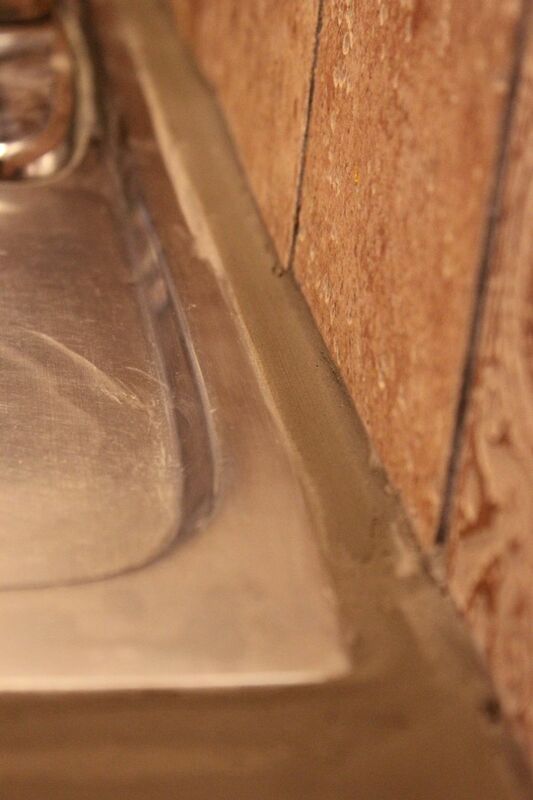 If gaps occur, where the concrete runs out, take your putty knife and add in a bit of concrete to the gap. 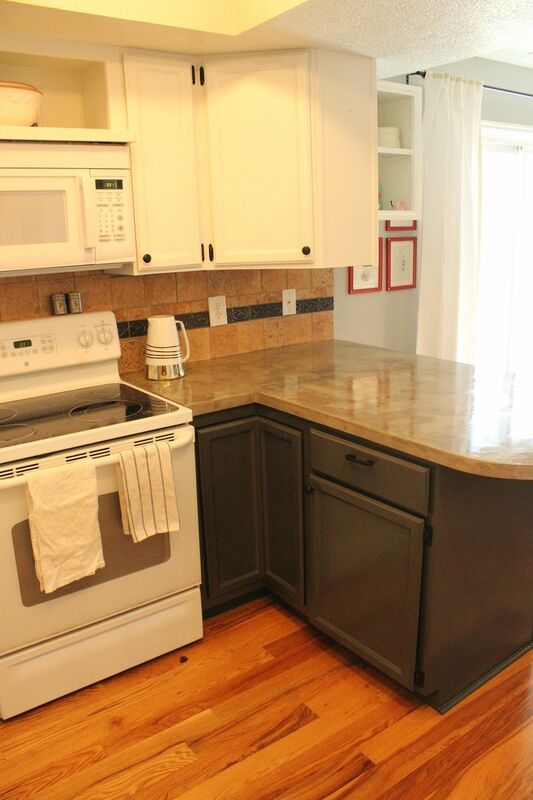 Run trowel over area again to smooth in the new addition. While you don’t want to run your trowel over and over the same concrete mix (it will start to dry out, and your efforts at smoothing everything out will be thwarted), I found it to be a good idea to drag my trowel in the perpendicular direction after a section was covered. This helped to alleviate major trowel lines. 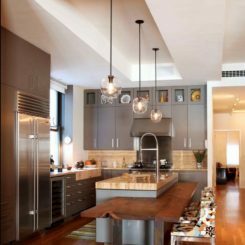 Continue in this way, getting a small section looking how you want it before moving on, all around your kitchen countertop surface. 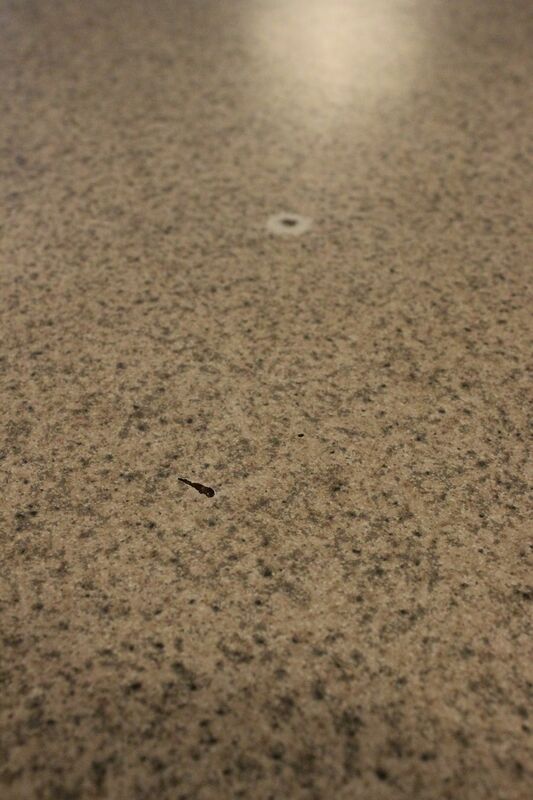 It’s important to “complete” a section before moving on, because the dry time of the Ardex Feather Finish is not long. 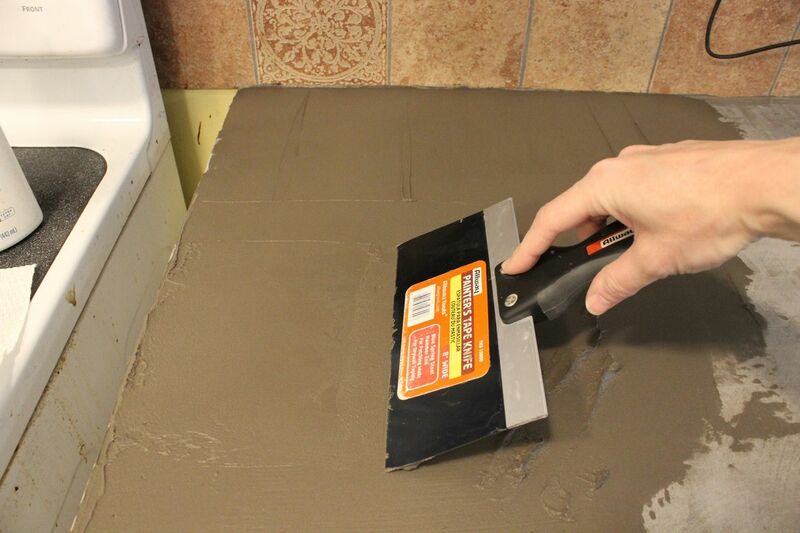 Using the smaller putty knife, spread concrete on the edges of the countertop. 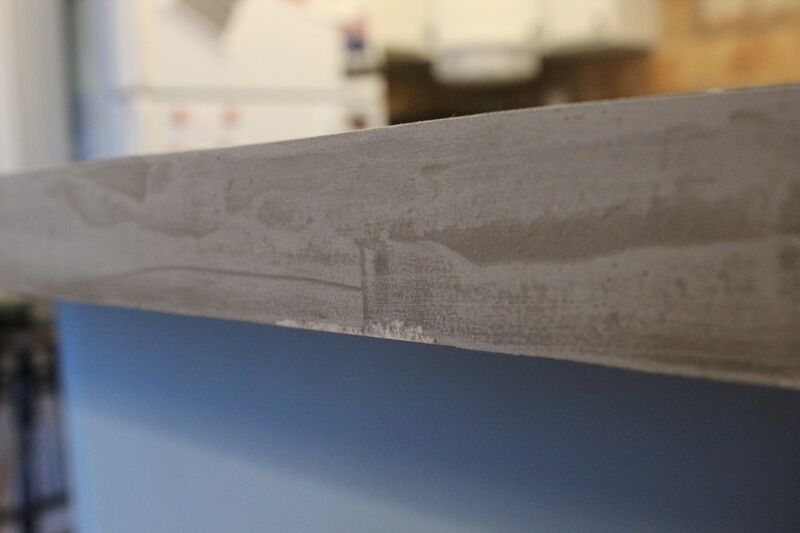 I found it best to strive for thick coverage on all corners (like the corner between the countertop’s top surface and the sides) and the edges, because this can be sanded smooth. 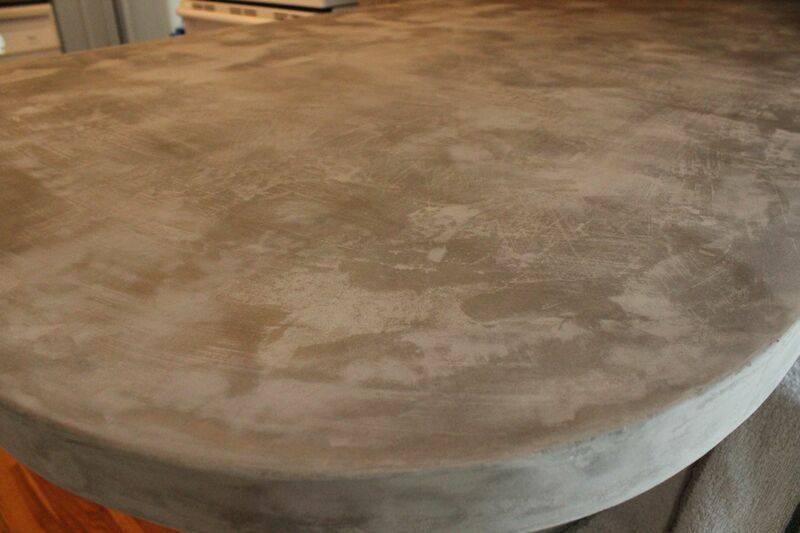 It’s easier to sand smooth when you have a little extra concrete to begin with. 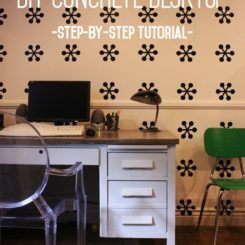 Tip: After the corner has “set” for a few minutes (5-10 minutes), I found it useful to go along with my fingers and mold the concrete smoother. The concrete will be a bit drier by this time, but it will still be malleable, which is prime condition for pinching it and getting a corner you really like. 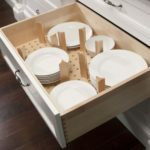 Of course, you’ll be able to sand later on, so don’t worry about making it perfect. 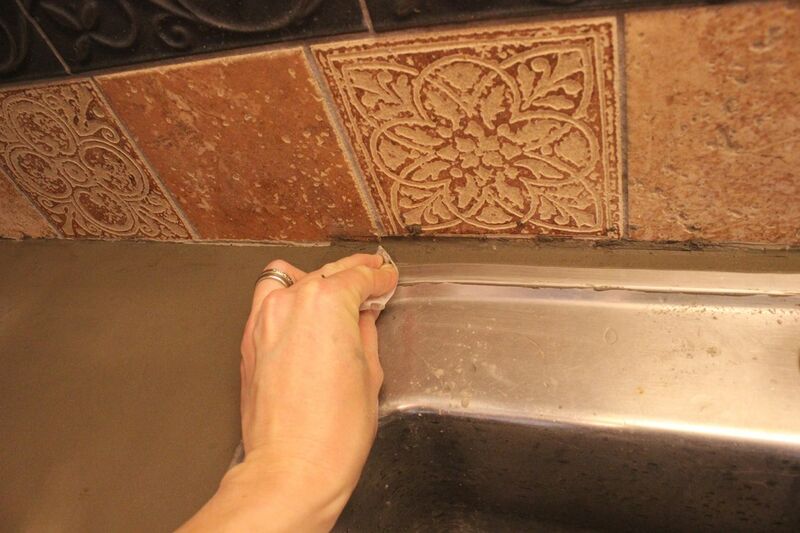 AVOID adding water in spots. 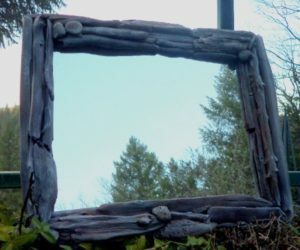 One strategy I attempted but now recommend that you AVOID is adding water to my fingertips and spreading the corners smooth, if I miss the window of malleable opportunity. 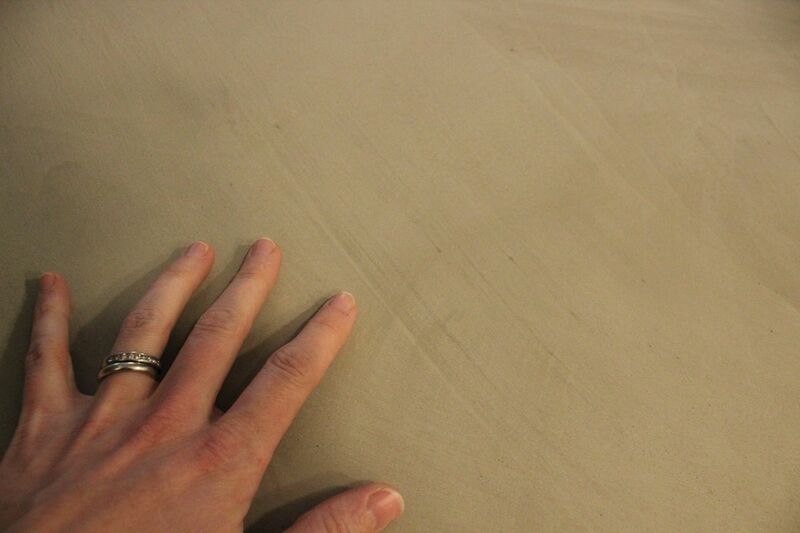 This is also evidence of powder-to-water ratio discrepancies and discoloration, even after it dries. 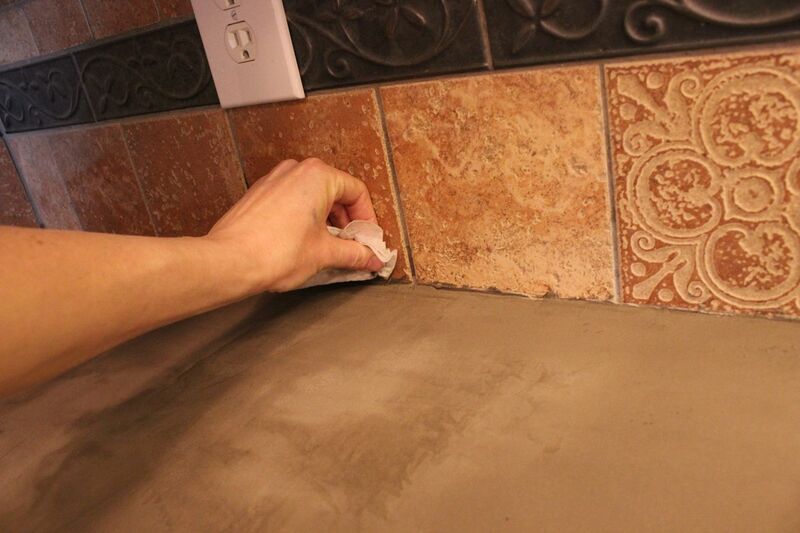 While concrete is still moist, run a paper towel or baby wipe along the edge to clean it up a bit. 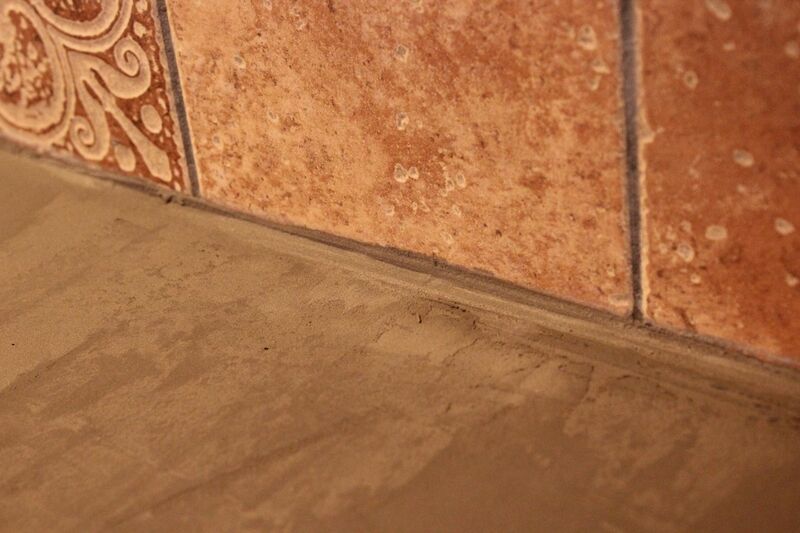 Don’t worry if you miss a spot; the concrete will scrape off fairly easily even when dry. 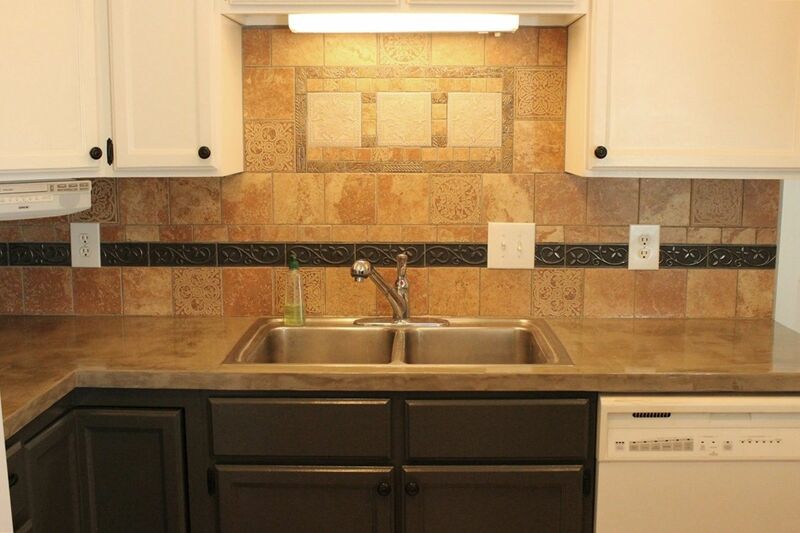 Step 4b: Work Around the Sink. 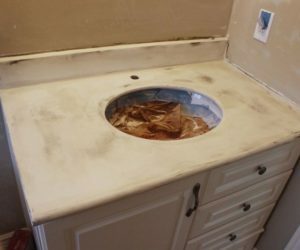 I kept my sink intact during this entire application process (rather than remove the sink), and this caused no problems. 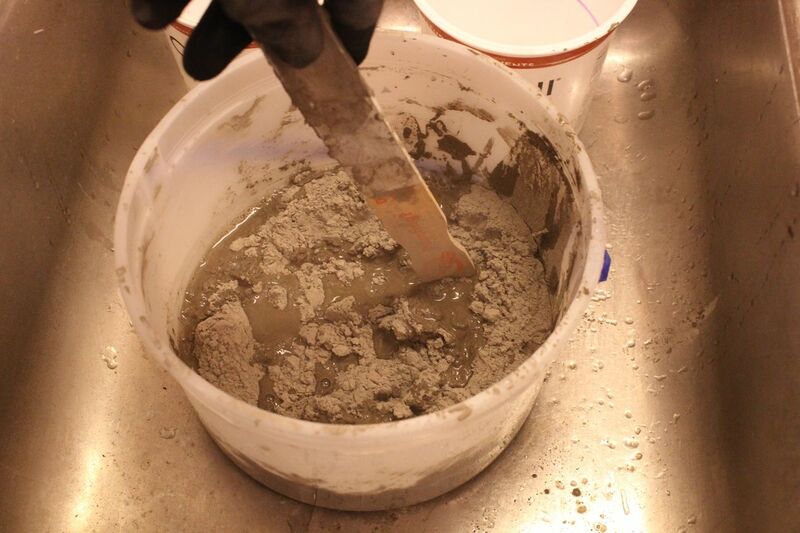 Use your finger instead of the trowel, if necessary, to spread the concrete behind the sink. This helps to ensure smoothness and even coverage. 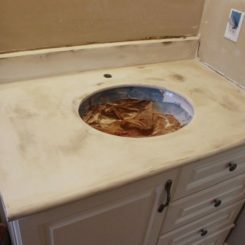 Wipe off the sink edges while the concrete is still wet for easy removal. 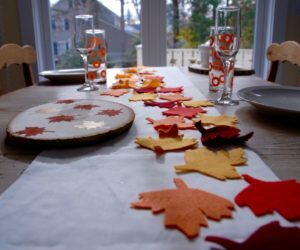 Step 5: Let dry. 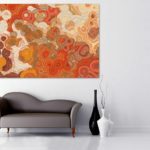 Keep in mind as you’re going that any irregularities or imperfections can be sanded out later on, so it’s best to just walk away after the surface is spread. Let it dry thoroughly, at least 24 hours. 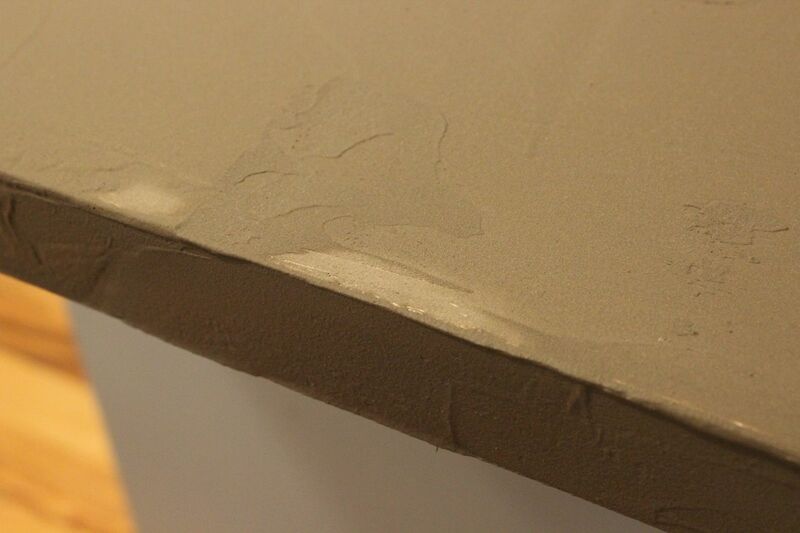 Step 6: Scrape edges when concrete is completely dry. 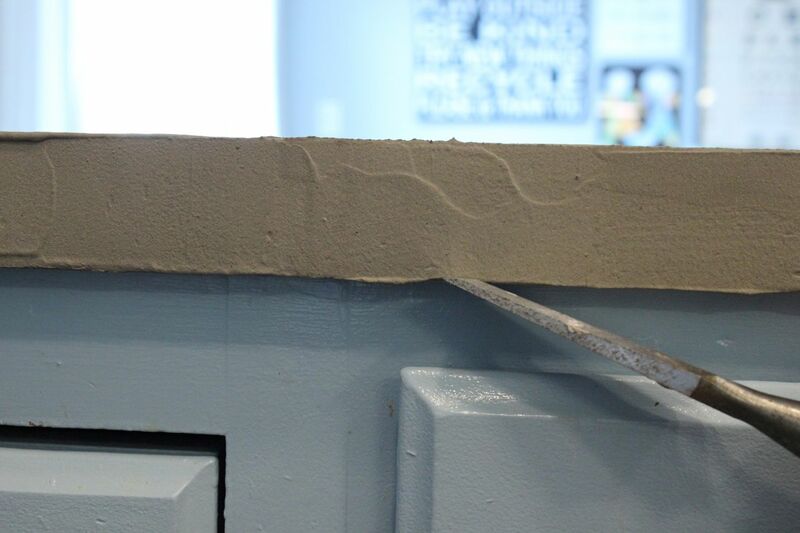 Using your putty knife (or a narrow chisel, as shown), scrape the bottom of the edge smooth. 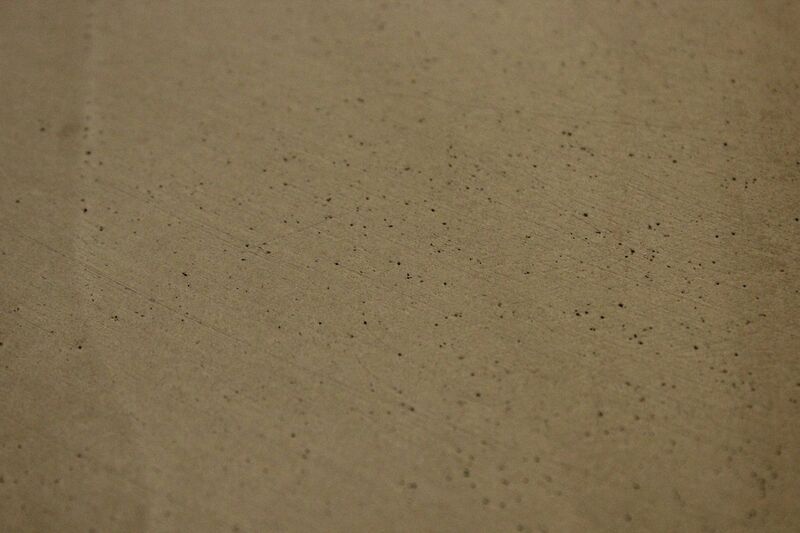 Tip: You may notice air bubbles in your concrete after it has dried. 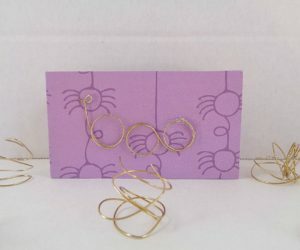 You can sand some of these away, but some will remain. 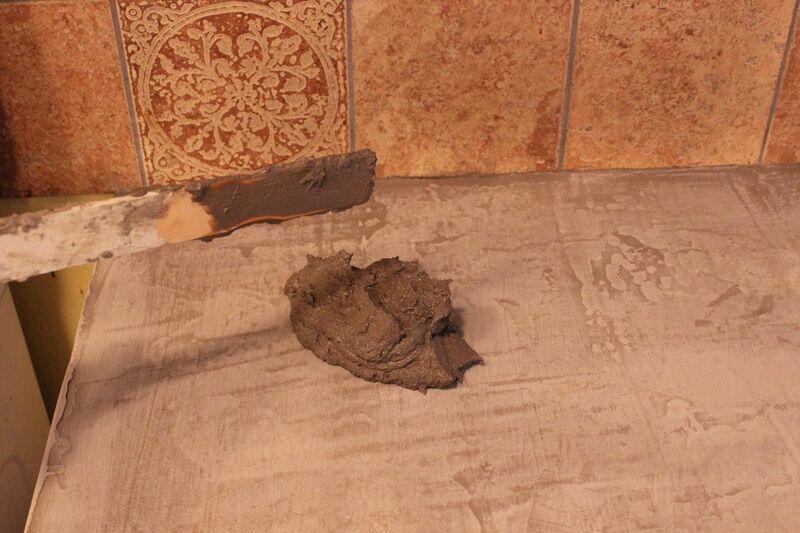 To decrease the chances of these air bubbles appearing, I found it helpful to slow down my trowel spreading. Don’t slap it around. 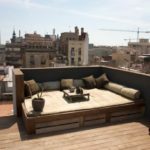 Also, keep the layers of concrete thinner, which will decrease the potential for trapped air while the concrete is wet. 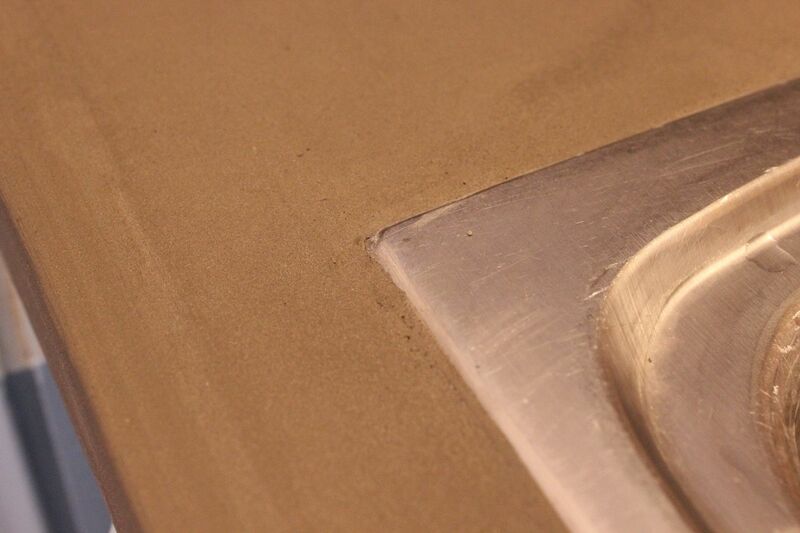 Step 7: Sand the surface. 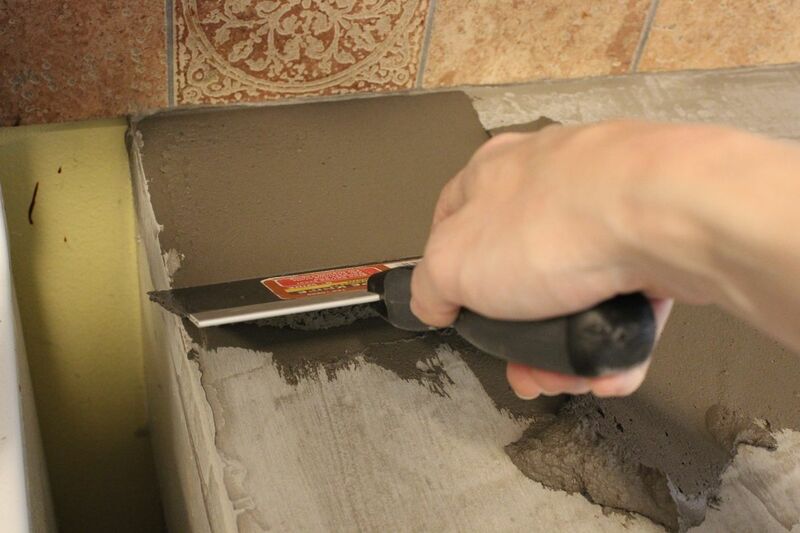 Using your coarse sandpaper (60- or 80-grit), begin sanding the surface of your dried concrete layer smooth. 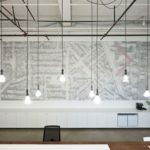 Pay attention to the feel of the concrete more than the color; trowel strokes might appear via color variations even when the surface is completely smooth. Note: Sanding this stuff is messy business. 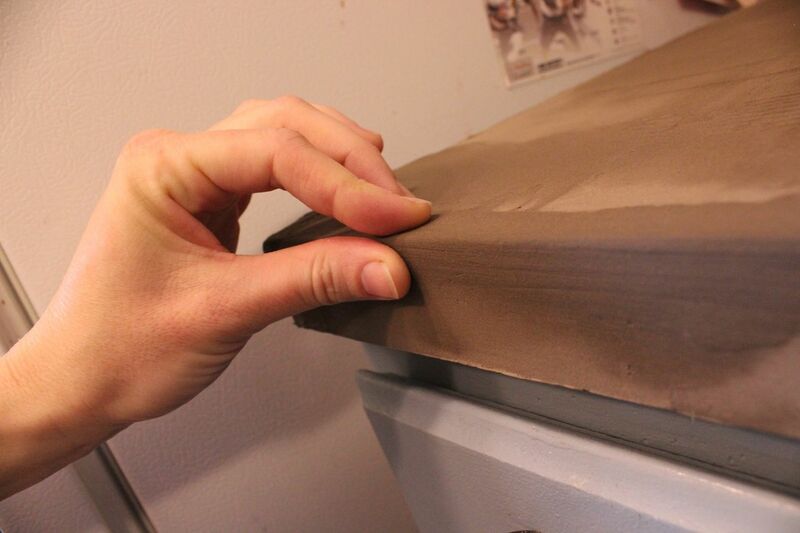 We recommend holding up the hose of a wet/dry vacuum next to your sandpaper to catch at least some of the powder. But you’ll still find it everywhere. On everything. Just prepare yourself for that. Wear a mask. 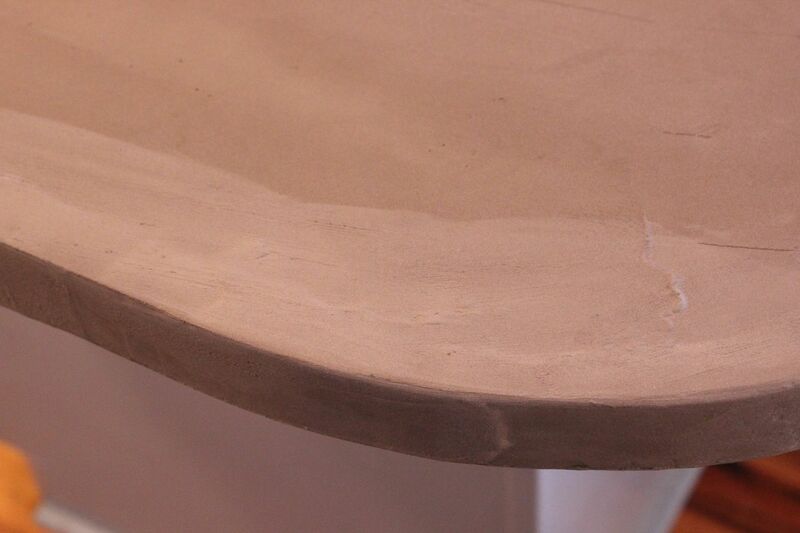 When sanding the edges, take care to not over-sand, which will take you back down to the laminate. 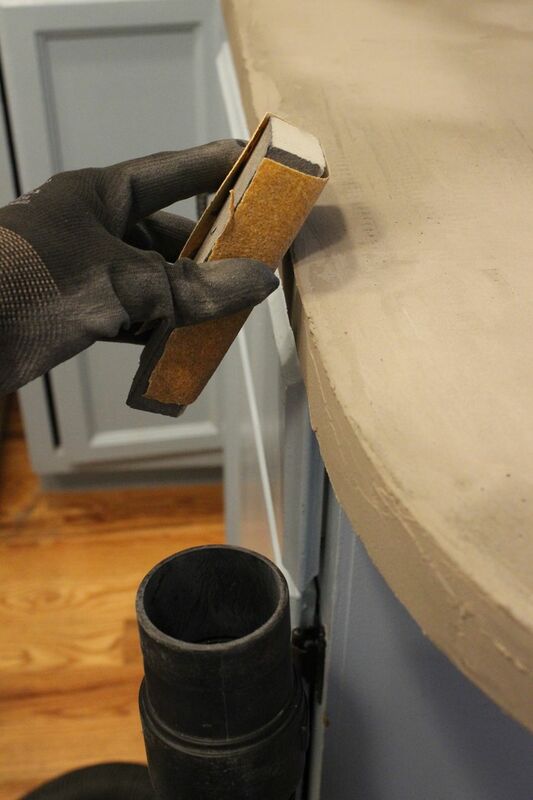 Tip: Wrap your sandpaper around a sanding block for greater control and smooth sanding, and wear gloves to save your hands. 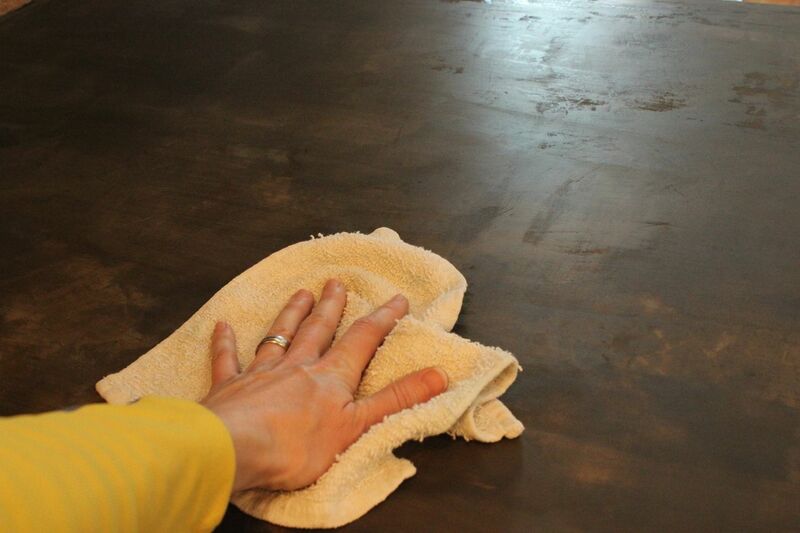 Wipe down the surface after sanding before proceeding. 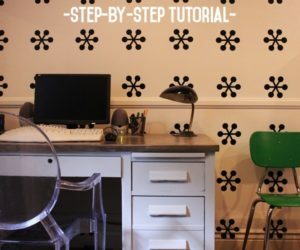 Step 8: Repeat steps 3-8. 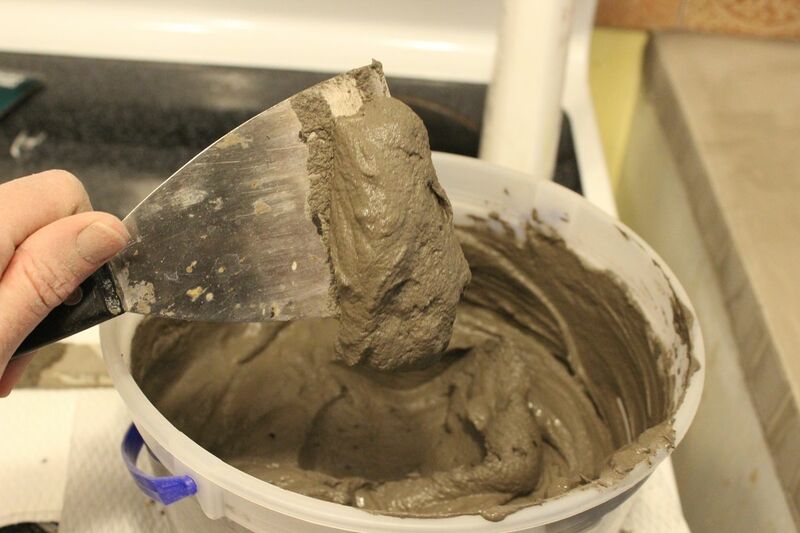 I recommend applying three or four total layers of concrete, sanding between each. 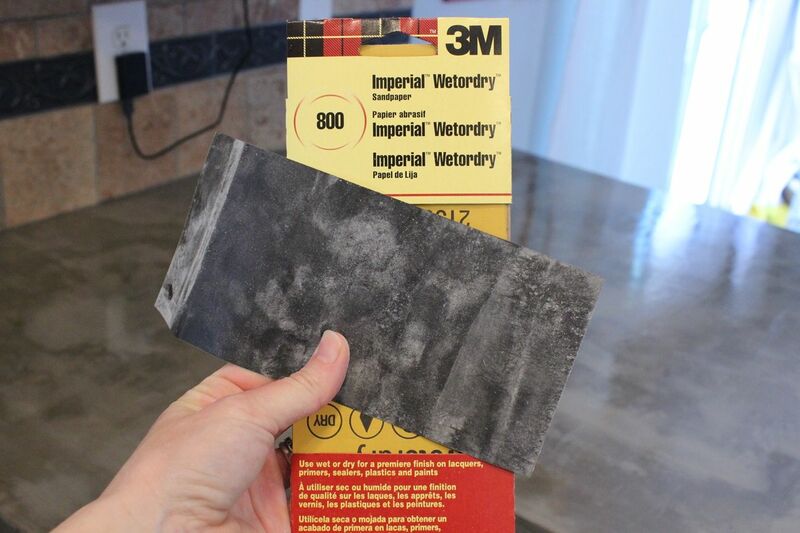 After the final layer, replace your coarse sandpaper with fine (220-grit). 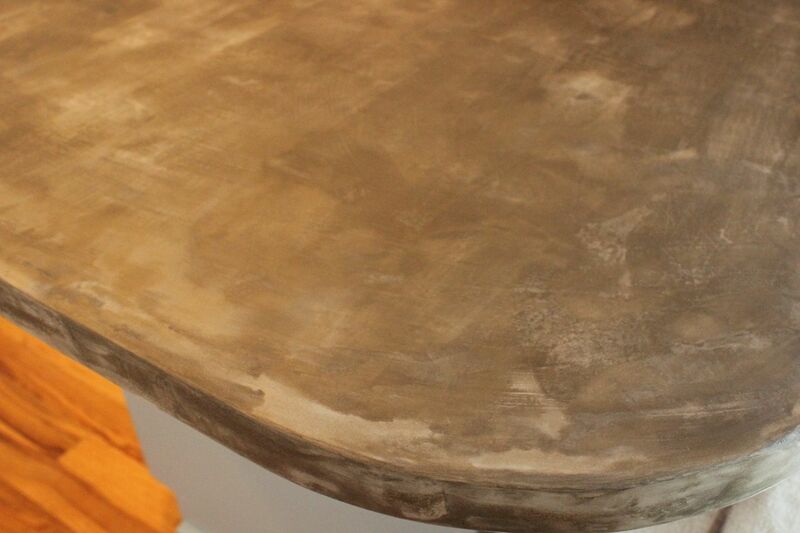 When your final layer is completely dry, and you’ve sanded it and wiped it down, you’re ready to seal it up! Step 9a: Gather sealant. We recommend two sealants that serve two different purposes. 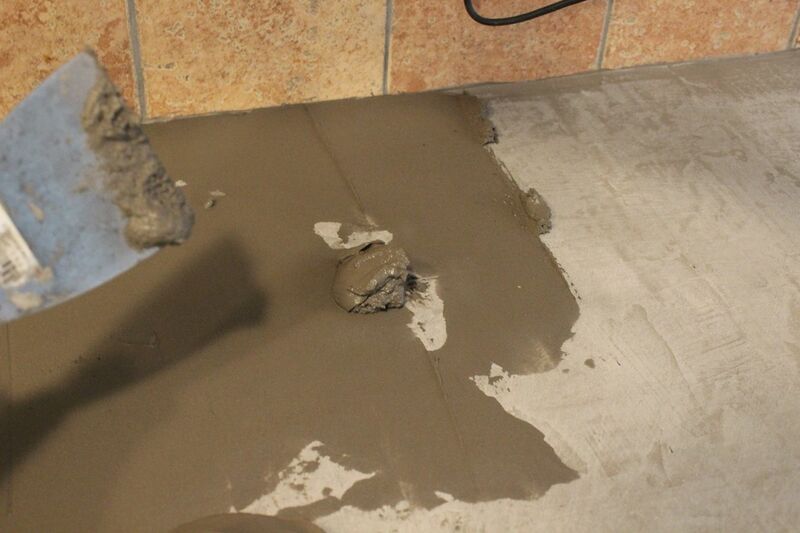 511 Impregnator Sealer serves to seal the concrete against moisture absorption and stains and goes on first. Step 9b: Apply 511 Impregnator Sealer. 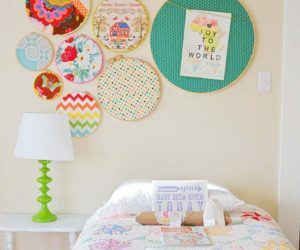 Pour a small amount of 511 Impregnator Sealer into a disposable plastic bowl and spread it on liberally with a paintbrush. 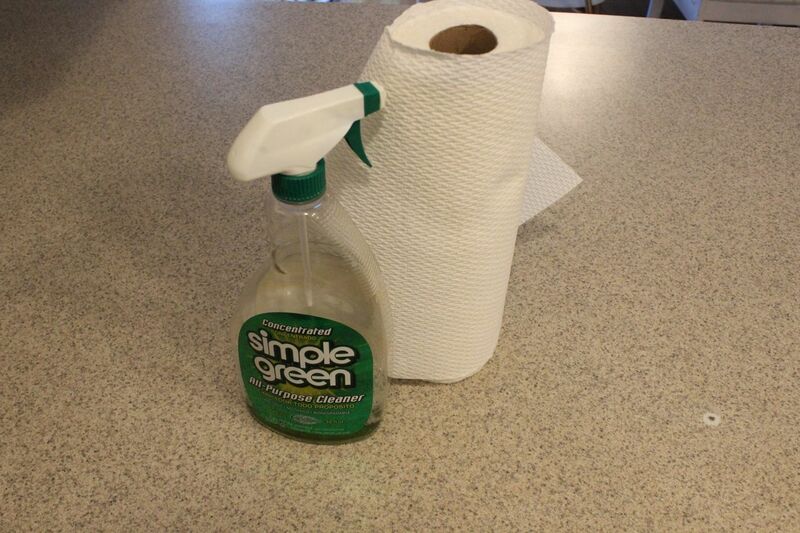 After a few minutes (5-10 minutes), wipe off excess, if there is any. I had very little excess, as this sealer was absorbed quickly and fairly thoroughly. But I wiped anyway. 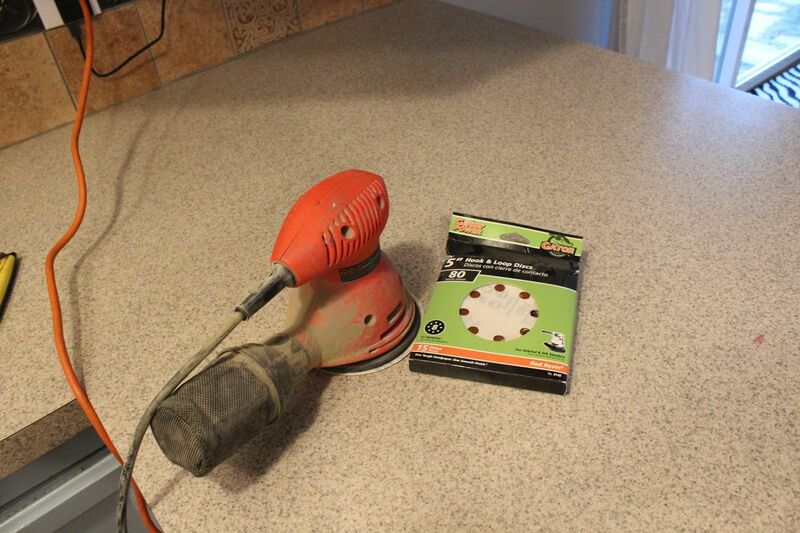 Don’t be alarmed if the concrete looks very dark when you apply this sealer; it will lighten as it dries. 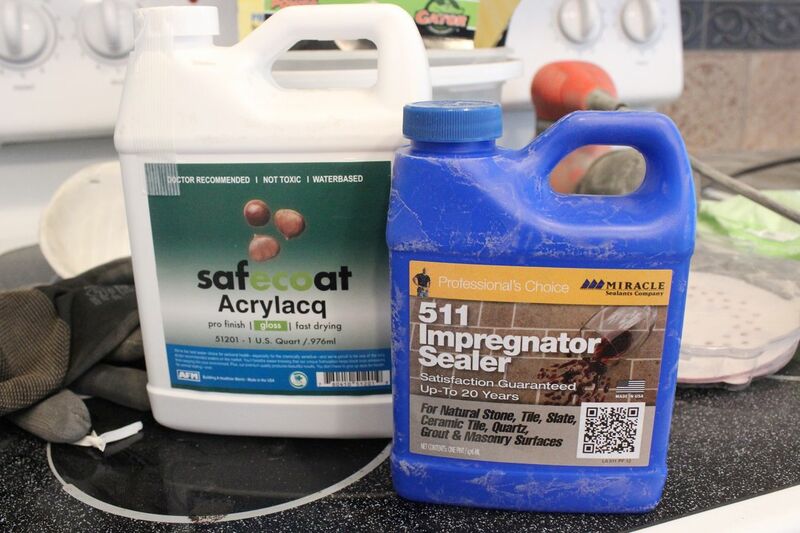 Allow to dry for 24 hours, then reapply a second coat of 511 Impregnator Sealer. 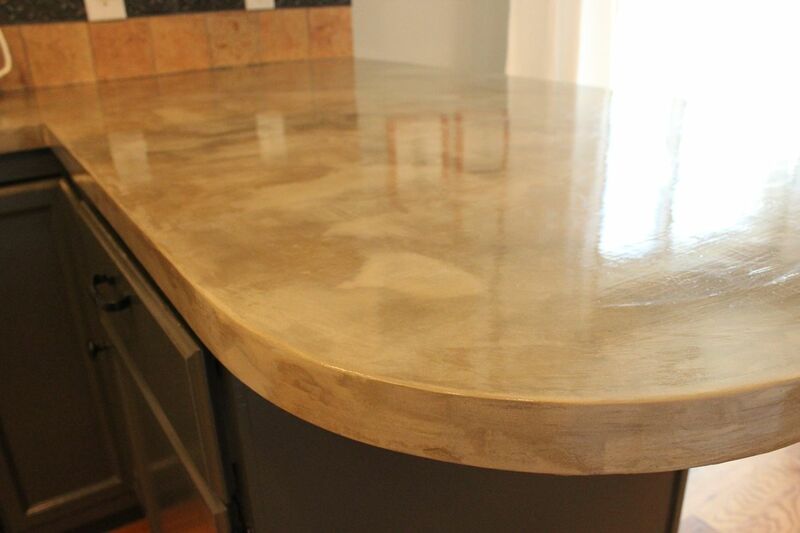 Be sure to apply sealer to the countertop edges as well as the surface. 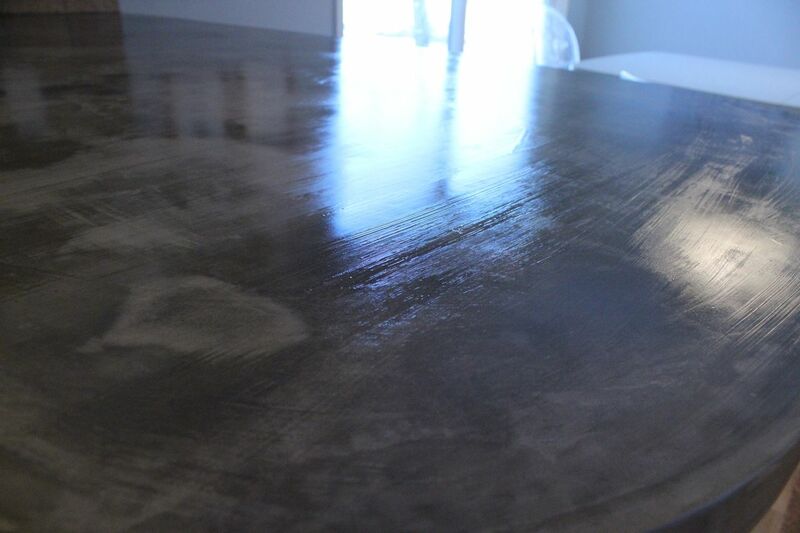 The dried countertop will feel extremely smooth after two coats of sealer and will have a slight subtle sheen. 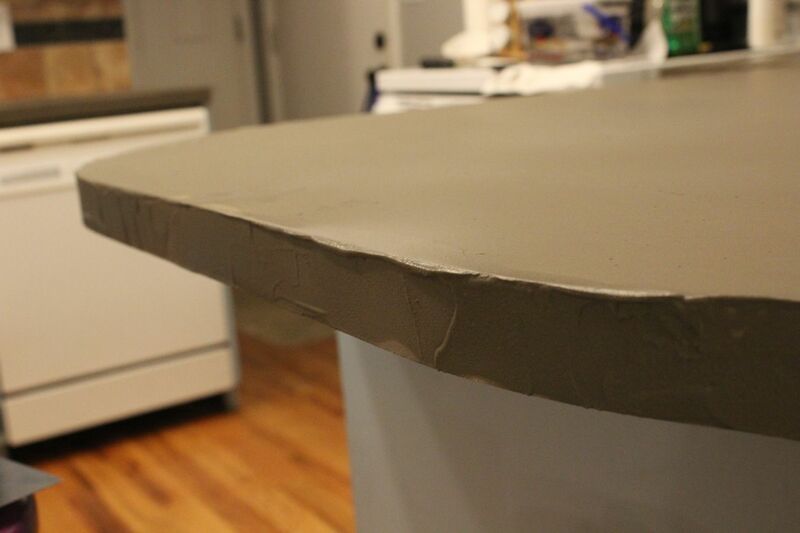 Step 9c: Apply Safecoat Acrylacq. 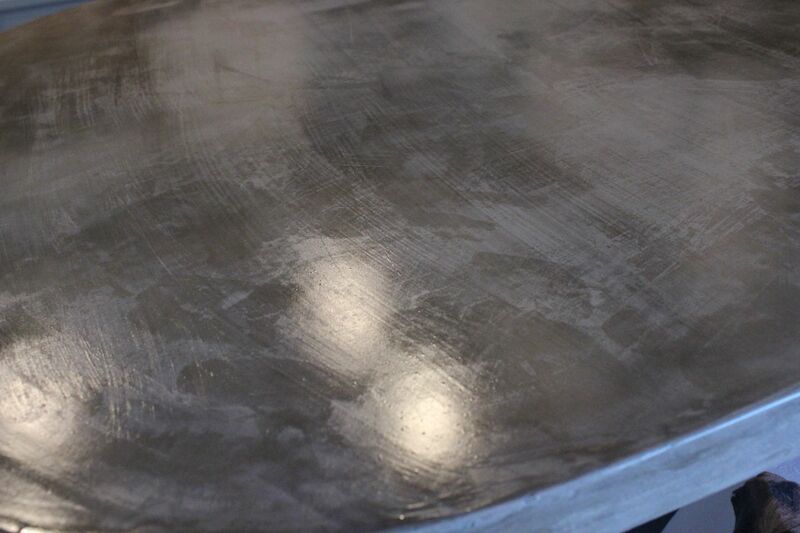 This sealer also works to seal the concrete against moisture and staining, but it also adds a polished, protective topcoat that protects the concrete against chipping or scratching. 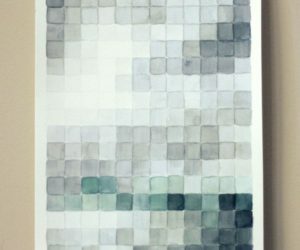 Pour a little bit directly onto the countertop, and spread slowly and liberally with a paintbrush. 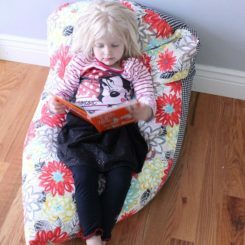 Allow Safecoat to dry thoroughly, which takes about 4-8 hours. 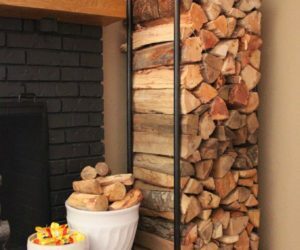 Even when dry, this will provide a glossy finish. 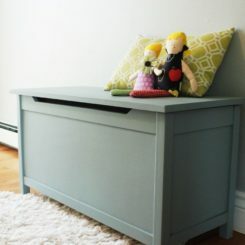 Use a very fine (at least 800-grit) sandpaper to lightly sand between each coat of Safecoat. 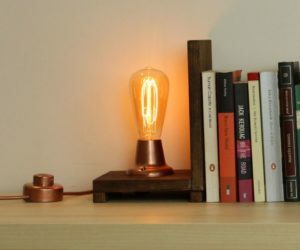 Sanding the final coat is optional. Step 10: Allow everything to dry and fully cure. 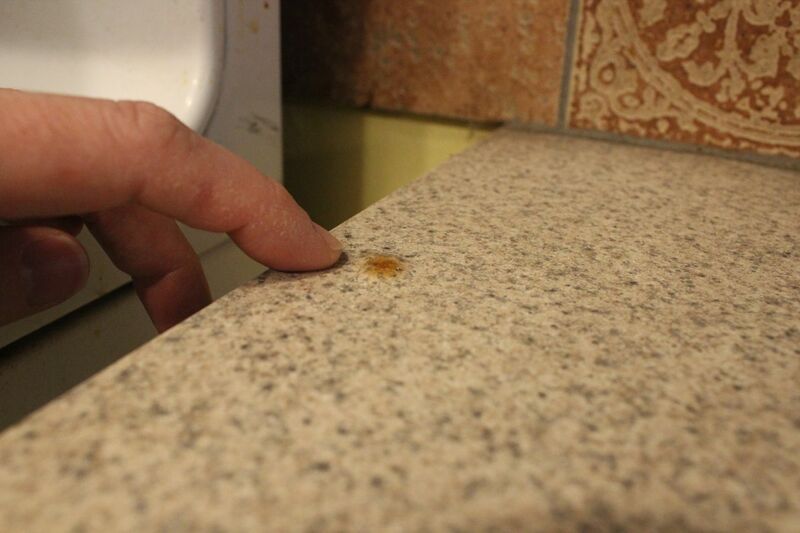 We recommend leaving the countertops alone for at least 24 hours but actually prefer closer to 72 hours if possible. 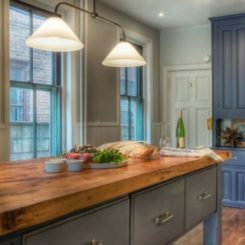 Doesn’t your kitchen feel (and look) fantastically updated? 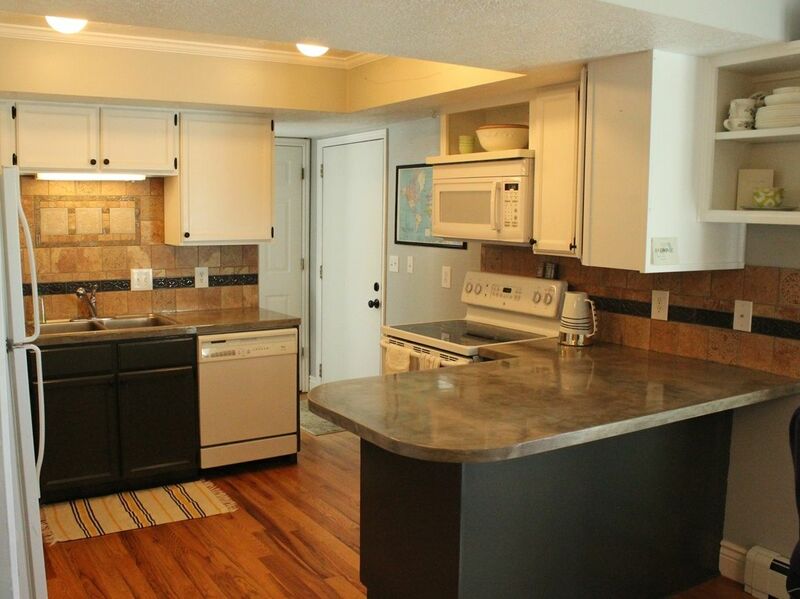 We wish you the best on your DIY concrete kitchen countertops endeavors and hope you love the end result. 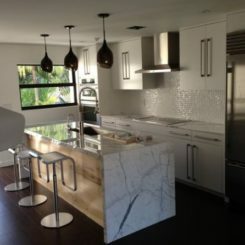 Marble Kitchen Countertops Are Coming Back ?